This full color 80 page book has newly researched and definitive architectural and cultural history of this bustling area of Manhattan's Lower West Side waterfront and the National Register City Landmark James Brown House of 1817. Dwarfed by industrial buildings and new residential towers, the little brick and wood frame James Brown House is the spiritual hub of Manhattan's West Soho neighborhood. The building's present incarnation as home of the popular Ear Inn pub is only the latest in a long and fascinating history. Ear*Inn*Virons traces the heritage and legends of this New York City landmark; through this tale, it also chronicles the history and culture of the vibrant West Soho neighborhood. When the James Brown House was built in 1817, the district was being transformed from swamp and sandy hills into a fancy residential neighborhood. Its first owner was James Brown, according to legend an ex-slave who fought in the Revolutionary Army. Over the decades, the House's fortunes have followed the rise and fall of the neighborhood, from middle class homes to bustling commercial waterfront to near-abandonment. In the 1970s, the area was almost a ghost town when a group of struggling artists stumbled on the building and transformed its bar, then a seedy waterfront dive, into the Ear Inn, once described by the NY Times as 'a dump with dignity." Now West Soho has been rediscovered by developers and high-tech firms, and the neighborhood is changing beyond recognition. As long as the James Brown House still stands, however, its history will not be forgotten. 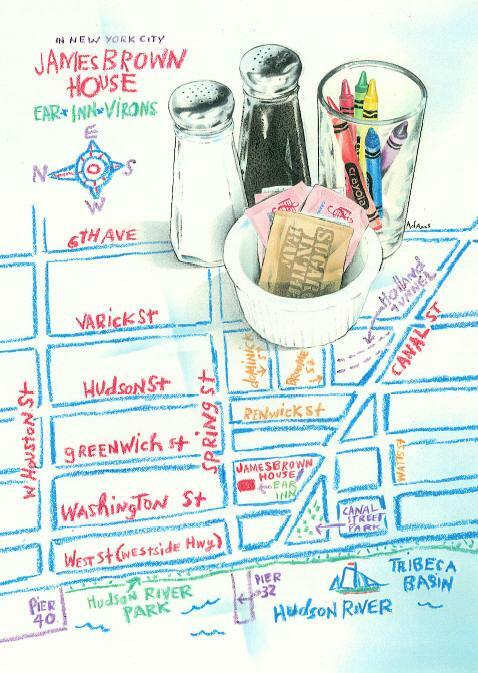 Beautifully illustrated with maps and period drawings and photos, Ear*Inn*Virons is the definitive history of the James Brown House and West Soho neighborhood. The text by the historian Andrew Coe documents the broad cultural and historical forces that molded the district, peppered with colorful tales about riots, gangsters, Irish bartenders, the daily life of longshoremen and a ghost named Mickey. Available at all bookstores in the New York and or American history sections. Also available via JamesBrownHouse.com or at the Ear Inn pub on Spring St (click on image for directions). such legends are the revenge of history lost." a whitewash of our scurrilous heritage!" fulfills an unknown and perhaps unknowable history of the impossibly past." Retail price: $16.95 ISBN 962-217-718-2 For wholesale orders contact W.W. Norton at 800-233-4830. For review copies, author interviews or more information, contact Rip Hayman at 212-966-0791 or earinnvirons@jamesbrownhouse.com.